How cute is former Miss South Africa Jo-Ann Strauss’ baby bump? Jo-Ann recently shared a photo of her growing belly on Instagram with the caption: “The bump starting to make its appearance”. 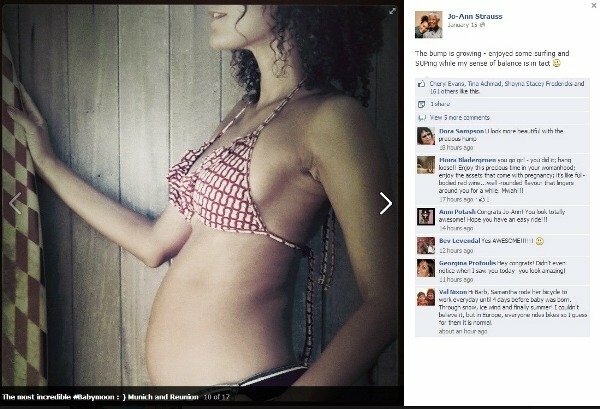 Jo-Ann, who usually keeps her personal life private, clearly can’t hide her joy with the pregnancy. We can’t wait to meet the little one, Jo! It’s going to be a bumper year for babies – Springbok star Bryan Habana and his wife, Janine, are expecting as is supermodel Lee-Ann Liebenberg.